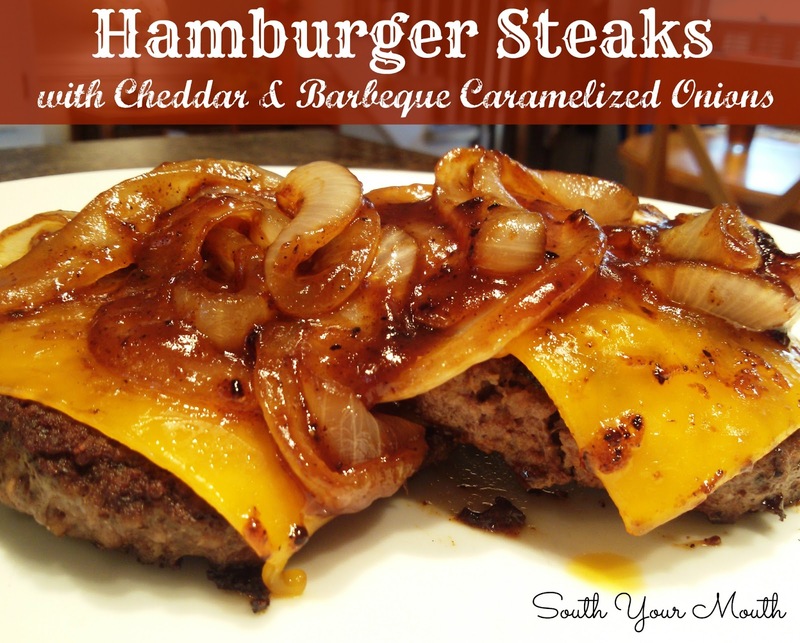 Hamburgers with cheddar cheese and caramelized barbequed onions. Serve as a hamburger steak or on a bun! So, I told y’all the other day that we’re on that last stretch before payday and all I've got in the freezer to work with is ground beef (I only grocery shop every two weeks so I have to work with what I have or starve). I have been pulling ground beef recipes out of my arse all week and, I’ll have to say, we've made the most of it! We've made Mozzarella Stuffed Meatballs, Cheeseburger Pie and Cowboy Beans, oh my! This is the last recipe I came up with this week and, though it’s nothing ground-breaking, it really is good! We ate these as hamburger steaks but they would have been amazeballs as a cheeseburger on a big ole crusty bun or onion roll. Heat a frying pan over medium-high heat. Once the pan is good and hot, add hamburger steaks and sear on one side for 3-4 minutes. Flip steaks, reduce heat to medium and continue cooking for 5-6 minutes or until juices run clear. Do not press down on steaks. Remove hamburger steaks from pan and add one slice of cheddar cheese to each. Increase heat to medium-high then add onions to pan drippings. Sauté onions until tender then remove pan from heat. Add barbeque sauce to onions and stir until thoroughly combined. When ready to serve, plate hamburger steaks and top with barbequed onions. YUMM! Saving this one - my boys would love them!